Settle in to the fully equipped log cabins at this KwaZulu-Natal nature reserve where the Mfolozi River meets the sea. There are 10 self-contained log cabins with 2 bedrooms at this KwaZulu-Natal nature reserve in the beautiful iSimangaliso Wetland Park, which is a World Heritage site. Electricity is supplied by generator from early morning through into the night time. 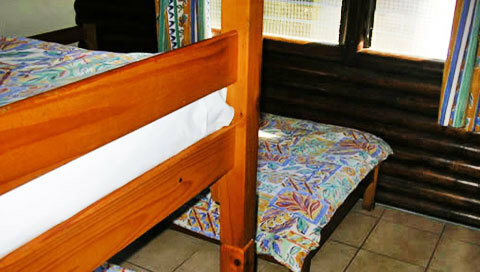 The cabins have 2 bedrooms and a bathroom, lounge / dining area and a fully equipped kitchenette. Three of the cabins have been refurbished. Visitors need to bring their own beach towels, food and drinks. The cabins are serviced daily. Enjoy a day in the great outdoors and then return to your accommodation for a tasty barbeque in peaceful surroundings. Maphelane has 3 refurbished cabins and you needn’t miss out on your favourite programme while on holiday in this remote setting.